Another day, another record for Simone Biles. Her record-breaking run at the 2018 worlds championships in Doha started with the all-around final on Thursday where she picked up her fourth all-around gold, making her the first woman to do so. She also tied Vitaly Scherbo for most world championship gold medals won at 12. The following day, she won the women’s vault gold to break out of the tie and own the gold medal record outright. She also won her first world medal on bars, making her the first American to win a world championships medal on all four apparatuses. 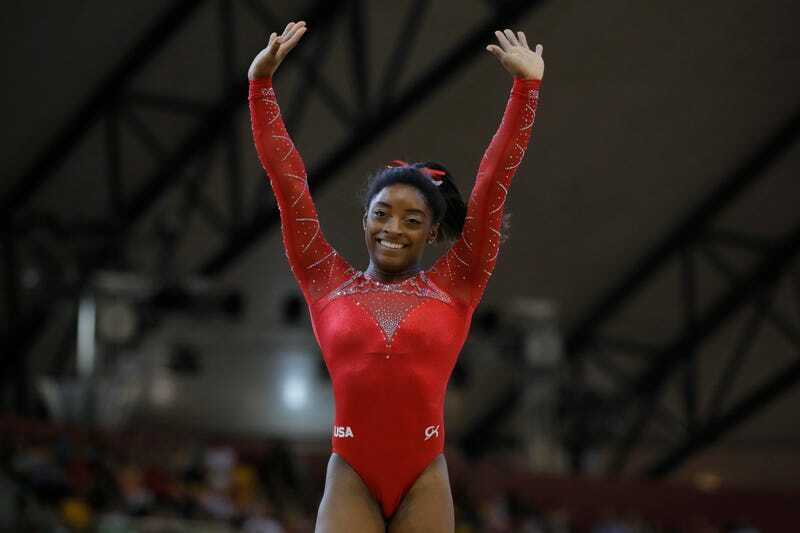 And today, Biles picked up the bronze on the balance beam and the gold on the floor exercise. The gold on floor was her 20th world championship medal, which ties her for the record with former Russian star Svetlana Khorkina, who accused Biles of doping last year in her memoir. But Biles has more gold medals than Khorkina so that breaks the tie between them, making Biles the most decorated female gymnast in word championship history. For a little while, it didn’t look like it was going to happen. Biles was up first on balance beam in the final and though she didn’t fall as she had in the all-around, she performed quite shakily, wobbling on the same skill she had fallen on the other day and missing connections between leaps in her routine. When she earned just a 13.6 after the routine with seven gymnasts still to go—including 2016 Olympic beam champion Sanne Wevers of the Netherlands—it didn’t seem like she could hold onto a medal and go for the record. There was just one event left to go after beam, the floor exercise. Biles was all but guaranteed the gold there based on her massive start value but without a beam medal, her total would stand at “only” 19. I thought the record would have to wait until next year’s worlds in Stuttgart. But then gymnast after gymnast either fell or struggled through their routines. Kara Eaker, the 15-year-old beam specialist who posted the highest beam score in the team final, came off on her mount. Wevers fell on a turn. No one topped Biles’s score until the second to last competitor mounted the balance beam. Ana Padurariu, a first year senior from Canada competing at her first world championships, hit a beautiful routine to go ahead of Biles. And then the final gymnast, Liu Tingting of China went up last and hit a gorgeous set to take first place and the gold, bumping Biles down to bronze medal position. On floor exercise, Biles took the gold by a point over teammate Morgan Hurd. All-around silver medalist Mai Murakami won the bronze; the floor podium was almost identical to the all-around podium, just with second and third places flipped. Hurd’s silver on floor is her third of these championships. The 2017 world all-around champion also has a gold from the team competition and a bronze from the all-around. So just one year and a day after she returned to the gym to train full time, Biles leaves Doha as the most decorated female gymnast of all-time at the world championships. And she did it all with a kidney stone. Correction: A previous version of this article incorrectly stated that Biles is the first female gymnast since 1974 to win six medals at a world championships or Olympics. This has been corrected.